This is the USS Brooklyn,.. the photo shows pretty good detail. I cant see any plating lines. Anyone know how the plates are joined to the ship? That's a really good question - I would expect to see some rivets. I know the stem and the hawse pipes would likely have been cast, but not the entire bow. I once read a lengthy article about early ship armor, turrets ect. The jist of what I read was that exposed rivets were bad because it created a point of failure from impacting rounds. It went on to say that armor plating was attached from the backside using special screw/bolt/studs that had an area machined down so they would not shear when a plate distorts from a strike. This would work with thick armor plate as there would be enough material to get ahold of. What puzzles me about the photo above is the material being viewed is what 1" thick?, two at the most on the lower part. Even if it was somehow attached from the back, where are the joining lines for the plates? The quality of the photo is good enough they should be visible. 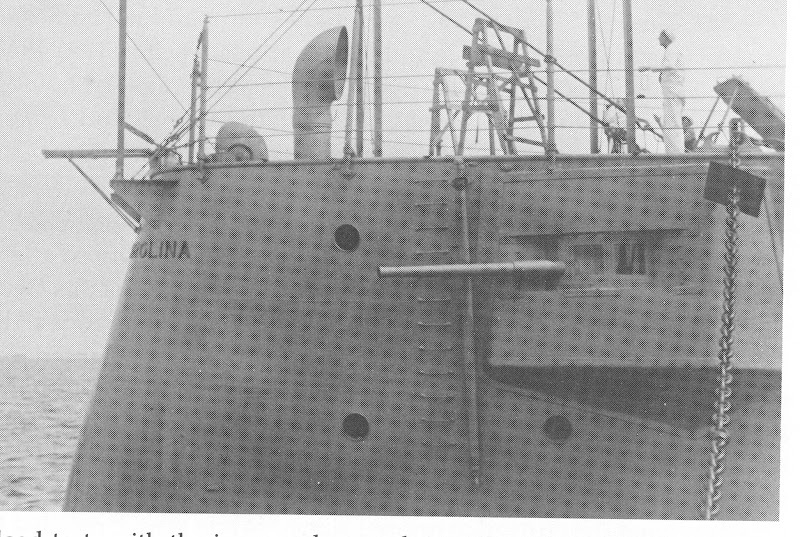 Even without magnification you can clearly see construction detail of the starboard bow gun. That is the closet pic I have of the hull. In the photo below you can see the plating on the bottom as it overlaps,.. I cant see the rivets,.. but I'd think they would be exposed on the underside. The dwgs I got for the USS Washington (ACR-11: Tennessee class armored cruiser) included a detail mid-ships section. On a launch photo, the joints on the primed upper hull are visible. Later pics with paint, they're not, so they musta been filled with something. The genius posting system took out all my spaces, so my diagrams using "_" make no sense at all!! Then the plates are joind from the backside and the joints filled. Hmm, makes me wonder what the plate thickness on the upper part of the hull is. I'd also wonder if the plates below the waterline are attached with rivets in a fashion that the heads are visible. If you look here, you can see the seams where the caulking has squirted out a little bit. Thats a great picture. And shows some era construction detail. I wish it wasnt so,.. but everything I see that shows detail seems to pose more questions. First of all,.. what is that protruding gun housings proper name? It cant be a turret,..? And I'm guessing the railings are round stock maybe with turnbuckles in places? I've been on an old ship (turn of the century era) and solid round with turnbuckles were used in alot of aplications including holding the smokestacks in place. Thanks for posting,. looks like you may have a plethora of reference material for your build. Maybe there are photos like this at NARA for the Brooklyn. Problem is, if you dont live nearby there is no way to order what you need. I wonder what it might cost to just order "all" photos they have for the Brooklyn on CD. Think I'll write them and find out. ...First of all,.. what is that protruding gun housings proper name? It cant be a turret,..? The life lines are stainless cable. As for the casement, notice the windows. We can't block the view from the Admiral's cabin, now can we? The national archives photographic section is much more responsive than the cartographic section. They sent me copies of photos within a week of receiving my request. So does anyone know if the rivets were exposed below the waterline? A British book with lots of diagrams, at least in one chapter, on plating and riveting. There is one on how the bow is constructed. That was, in fact, common practice with ship building in general, to counter-sink the rivets (Actually, the heads go on the inside). Awesome find - that's a great reference! !